As part of the Plant for the Planet initiative, AccorHotels has been working in partnership with the China Zigen Association for Rural Education and Development for the past eight years to develop a fruit orchard in Qinglong county, Hebei Province. Beijing officially joined the Cities Changing Diabetes program on December 20. It is the first program launched since the Beijing Municipal Commission of Health and Family Planning and the Copenhagen Public Health Bureau signed a memorandum of understanding on public health in June. Chinese dairy company Mengniu Group has formed a partnership with FIFA, the international governing body of football, to become an Official Sponsor for the 2018 FIFA World Cup Russia. Xianyang High-tech Industrial Development Zone's CNY 100 billion electronics information industry cluster rises. The Shenzhen International Marathon 2017 started in Shenzhen on December 17. About 30,000 runners from different countries and regions participated in the competition, marking the end of the Run China marathon series. 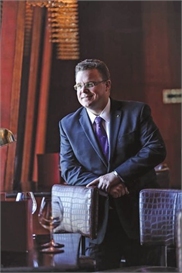 On a Friday morning, Mr Jens Corder walked confidently into The Lounge, a bar at the China World Summit Wing, located on the 80th floor of the ionic China World Trade Center (CWTC) complex in Beijing's Chaoyang district. The Ritz-Carlton, Beijing held their “Puttin' on the Ritz” 10th anniversary celebration on December 12. Chinese security and inspection solution and service supplier Nuctech Co Ltd announced to open new offices in Rotterdam and Amsterdam on December 12. Nuctech provides technology services with independent intellectual property. The first train made by CRRC for the Boston's Orange Line in US finished its first formal debut on October 16th. Park Hyatt Beijing rang in this year's festivities with the Masters of Food & Wine culinary journey in The Gallery of Park Hyatt Beijing, on December 12. Wanda Sports Events and Resources Seminar took place in Beijing on December 13, during which top domestic sports resources were showcased and discussed. An online media platform jiemian.com and the British technology company Dyson announced the results of a survey in Beijing on December 14, suggesting that the minor particles in the air are being ignored in homes in large domestic cities, and that Dyson has a plan to do something about it. The Ritz-Carlton Hotels announced recently that the 2018 Tokyo-Osaka Michelin Guide, the regional edition of the most distinguished culinary reference in the world with its celebrated annual awards of excellence in international haute cuisine, has awarded Azure 45 at The Ritz-Carlton Tokyo a Michelin star for the third consecutive year, and newcomers to the list this year La Baie at The Ritz-Carlton Osaka and Tempura Mizuki at The Ritz-Carlton Kyoto each gained a Michelin star. The international auto brand Volvo Cars participated as the Official Car of Nobel Week, offering 30 cars including the S90 Excellence Lounge, XC90 and All New XC60 during the 2017 Nobel Week in Stockholm, transporting Nobel Laureates and VIPs to the Nobel Prize Award and the Nobel Banquet. The United Nations General Assembly (UNGA) granted observer status to the International Bamboo and Rattan Organization (INBAR) on December 7. During the Fifth Meeting of China-UK High-level People-to-people, Cultural Exchanges in December of 2017, China-UK Science and Innovation Forum and Achievements Exhibition was also held at the Royal Society on December 6th. The V-Alliance Future Elite Day organized by Vanke Group took place at the newly constructed compound in the Emerald Community in Changping district on December 8, drawing the participation of several young CEOs and business representatives in domestic innovation and the IT industry to speak about future trends and lifestyles. The jury's decisions to name the Best Actor/Actress, Best Director, Best Screenwriter, Best Producer and Best New Asian Icon will be announced at the award ceremony in Berlin on February 21, 2018.